Demand for the Hyundai ix35 has been unprecedented not only across Europe, but also worldwide, placing supply under intense pressure and resulting in long waiting lists for the 2.0-litre diesel deriviative in particular. The Hyundai ix35 1.7-litre diesel model is more freely available so Hyundai has taken action to ensure that its 200 longest waiting customers receive an interim solution. The offer will enable customers to own a new 1.7-litre diesel manual ix35 immediately, and run it until their original ix35 2.0-litre diesel is ready. Customers can then move to the new 2.0-litre car – all for the price of their original order. Hyundai sees this as a good way to keep its customers mobile in the same vehicle that they ordered, although the engine is slightly smaller, and the 1.7 is two wheel drive, this still offers a great opportunity to drive the new ix35 now. Customer buys a 1.7-litre diesel ix35 from their dealership before the end of March – at the same time completing any part exchange they intended. When the customer’s ix35 2.0-litre diesel they ordered is ready, they can part exchange the 1.7-litre diesel at the price they paid for it, against their new 2.0 diesel - paying only the difference between the price they paid for the 1.7-litre and the price of the new 2.0-litre car as previously agreed with their dealer*. 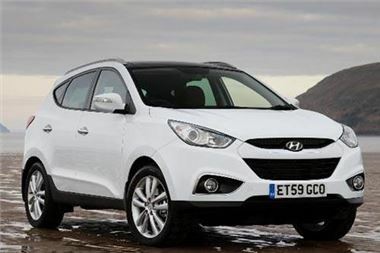 Hyundai is currently looking at the feasibility of rolling out this offer to other customers.